Mothering with Creativity: Homeschool Questions: How Long is Your School Day? One of the most common questions among homeschoolers and those looking to homeschool alike (and let's face it-non homeschoolers as this all the time, too) is, "How long is your school day?" Everyone wants to know how long it takes to homeschool a child. Does it take all day? Can you do it quickly? 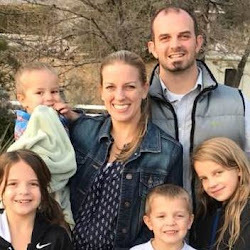 What about when you have multiple children to homeschool? Are you going to be stuck at your table all day long? Is there time for fun stuff? Time for work from home moms to get work done? So today....I'm going to tackle this question! To start, I must preface this by saying that your individual teaching style and your kids' learning styles will undoubtedly have a HUGE impact on the amount of time you spend each day "schooling" your children. If you are a parent who aims to recreate a traditional school setting at home, your day will likely look a lot different than a mom who aims to make her homeschool unlike anything at a traditional school. Neither is right or wrong, just different, but they will affect how much time you spend homeschooling. I lean towards the relaxed homeschooler, student-led, interest based type style in our home. I consider our "sit-down school" to be math and language. History, science, geography, social studies, art, fitness, home economics, and reading are all subjects that are generally taught through living books or hands on projects, with all the kids together, at varying times during the day. These subjects are relaxed, and accomplished all over the house, and outside of the house. Sometimes these are even done via audio books at bedtime. On most days, my kids are done with all aspects of math and language within an hour total. Yes, an hour. And for some of them, it's actually less (like my kindergarteners). These are often the first subjects we tackle in the morning since they are our "sit down" subjects, and it feels good to get them done. Once these are done, all other subjects are much more relaxed throughout the day. Kindergarten is usually a breeze. I'm currently on my 3rd kindergarten student, and have found that EVERY subject can be easily covered in just two hours if you are teaching just a single kindergarten student (not accounting for play breaks). Each grade level beyond this adds a little more time to accomplish all subject matter. I currently have a 5th grader, a 3rd grader, a kindergartener, and a preschooler. All children work on language and math with me at the table in the morning. Sometimes, one child may start earlier than the others, and other times we all start together. If one child is needing a lot of hands-on direction, I might send the other kids to go play a while so we can work distraction free. On these types of days, our day will extend a little longer. Otherwise, it works really well to have all the children working on math at the same time while I'm available at the table to help them all out as needed. I have early birds, and when my children have highly motivated mornings, we are sometimes done with math and language and even a few other tasks by 9:00 in the morning! Those are fun days, with lots of time for exploring and playing. Beyond math and language, which take us about 1 hour in the morning, it is actually difficult to put a finger on how much time we spend on school each day because it generally is so relaxed and weaves into our day so well. We read books in the living room or outside together, do projects at the table while I cook in the kitchen, and regularly watch Youtube videos to answer the five-million questions that pop up throughout the day. We do martial arts in the evenings all together as a family, co op classes once a month, field trips twice a month, and meet up with friends in between. I would estimate that in total (even with four kids), we spend only 4 hours on school-related activities each day, but it's very broken up. As a mom who also runs a business on the side, I find that I have more than enough time to get all my work on the computer done throughout the week. I can usually budget time to work on my Kindermusik business, write for my blog, and work on building and household projects. The kids go grocery shopping with me, and I use this as a learning experience for them (lots of math can be done here!). The children are responsible for helping with household chores like laundry, sweeping, cleaning bathrooms, washing windows, taking care of animals, and more. This means they not only are helping around the house but are learning their home economics. My girls (8 & almost 10) are responsible for making lunches nearly every day. They love to work in the kitchen and so I give them lots of opportunities to do so. In my opinion, a lot of school can be done just by being intentional about every day life with them. There are so many great opportunities for learning throughout the day, and I just try to capitalize on them. Remember, every homeschool will be different. Your style may mean that your day is longer or shorter than mine. 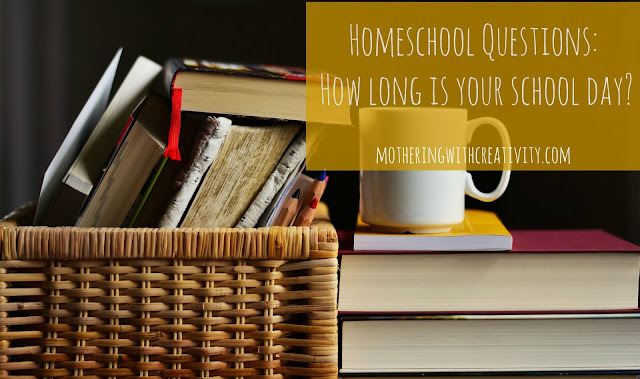 Hopefully this glimpse into how long it takes us to homeschool with my style of homeschooling is helpful for you. Find what works for you and your family. What is important? What subjects do you feel you need to do everyday? What subjects make you feel accomplished? School doesn't have to take all day. Start with those and move onto the others throughout your day. Don't forget to plan time for play and exploration and FUN! Do you already homeschool? How much time do you spend on school each day?